There is a new sensation in Stephenville, and it doesn’t involve a rodeo or agriculture. 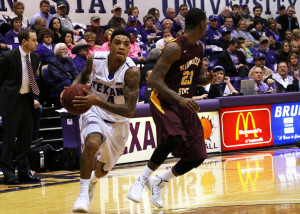 The Tarleton Texans have quietly been putting together a historic season setting records for consecutive victories and the best open of a season at 18-0. Even with the Texans suffering their first loss last Wednesday, they have already started a new streak and their record currently sits at 19-1. The team still has a lead on Midwestern State for lead of the Lone Star Conference. The Texans are lead by senior point guard Chuck Guy who has had a fantastic scoring season and has even had career highs in assists during the Texans’ current impressive run. Guy isn’t the only one getting in on the fun though. De’Andre Upchurche and Tashawm Mabry have had fantastic scoring games this season to help the Texans stay on top. Currently, the Texans have a one game lead on 15-6 (7-2 in conference) Midwestern State and hope to widen that gap as the regular season winds down. 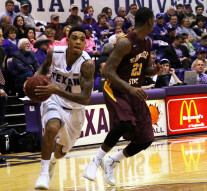 Senior Chuck Guy leads the Texans on a fast break against Midwestern State. It will be the first time such a spotlight will shine on Tarleton for basketball and the Texans are hopeful plenty of students and alumni as well as Stephenville residents will have their eyes on the TV. The Texans have been playing so well this season that their games have been decided early enough to get quality minutes for some of the younger players. The current Texans roster is senior heavy, but Tashawn Mabry and Deven Carter are still juniors and are playing major roles for the team this year and are getting to see the senior leadership first hand. The guys know they have big shoes to fill going forward, but with quality minutes this year and continuing to practice, they will be more than ready when it’s their time. As it stands, the Texans look like a lock to make the NCAA tournament, but the seeding will be something to pay close attention to. If the Texans can continue their winning ways all the way through the Lone Star Conference Tournament, they are all but guaranteed a number one seed. The LCS Tournament goes on during the weekend of March 5-8 in Allen, Texas and the team hopes to see the gym out there decked out in purple.